[ Rosamund Lehmann ] Autograph Letter Signed "Rosamund Lehmann" to a "Miss Murray"
[Headed] Llanstephan House, Llyswen, Brecon, 13 August 1939. Three pages, 12mo, good condition. "Mrs Lynd's [ Sylvia Lynd, author ] letter about the Femina Committee followed me here where I am spending a few days. The onlky objection I can see to inserting the word 'formerly' before F.V.H. [Femina - Vie Heureuse ] is that the title of the Prize Committee would be even more unwieldy than it already is!- but of course I am in favour of trying to settle the difference between the two French committees, and hope Mrs Lynd will write the letter she suggests in her letter. I must admit that I didn't realize there were two [underlined] French committees." [ Rosamond Lehmann, novelist. ] Autograph Letter Signed ('R.') to 'Dearest Geoffrey', regarding an unnamed woman's conviction that he is 'Pourponne'. On letterhead of 70 Eaton Square, London SW1. 17 March 1972. 2pp., 8vo. On aged and worn paper. The letter begins: 'Dearest Geoffrey | She is quite convinced you were Pourponne! - says it was given to her before she saw your photographs - (about which she says some very gratifying things!) How does this strike you?!' The woman is 'hunting for a confirmatory portrait'. While Lehmann herself has 'only the haziest impression of Pourponne', she does know that 'they were mutually devoted' She exclaims: 'Oh do hurry up & start this book! [ Pamphlet. ] Sensational Revelations! Life in English Prisons. 'The Anarchist. Vol. 2 - No. 18. June, 1895.' Printed and Published by David Nicholl, 7, Broomhall Street, Sheffield. 16pp., 12mo. 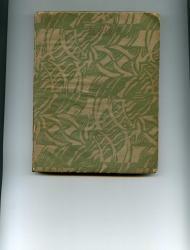 Disbound without covers. In good condition, on lightly-aged paper, with reverse of last leaf browned. Separate title-page, with only the following on it: 'SENSATIONAL REVELATIONS! | Life in | ENGLISH | PRISONS. | ONE PENNY.' Drophead title on p.3 with details of 'The Anarchist'. Duncan's article runs from p.4 to p.8, and is titled: 'Life in English Prisons. | The First Night in the Cells. [ Lancelot Spicer and Radical Action. ] Two Typed Letters Signed to Mark Bonham Carter, discussing the aims of the group, the resignation of Wilfrid Roberts and a dinner for Sir William Beveridge. With copies of two letters from Bonham Carter. Spicer's first letter: On letterhead of 16 Pelham Place, Kensington. 31 December 1943. Spicer's second letter: On Radical Action letterhead, 346 Abbey House, Victoria Street, London. 17 November 1944. The four items in good condition, on lightly aged and worn paper. ONE: TLS by Spicer, 31 December 1943. 4pp., 12mo. With a couple of minor autograph emendations. A long and wide-ranging letter, discussing the aims of the group (in response to Item Three below). Topics include: 'intellectuals in the Group', whether it is 'disuniting the Party', 'the future of the Party', 'going into opposition', 'the position of the Liberal Party at the next General Election, or at the conclusion of the European War', and whether Radical Action is 'pin-pricking the Parliamentary Party'. [ James Bolivar Manson, artist and Director of the Tate Gallery, London. ] Autograph Letter Signed ('J. B. Manson') to '[J.G.] Wilson', of booksellers, Bumpus, making suggestions for the placement of 'scraps of Irish Architects'. On letterhead of the National Gallery [i.e. Tate Gallery], Millbank, SW1 [London]. 3 July 1929. 2pp., 12mo. In good condition, lightly aged. He considers that 'the scraps of Irish Architects' might be 'very useful for reference', and suggests offering them to the Royal Institute of British Architects or Association of Architects. In the latter part of the letter he makes suggestions regarding a meeting the following week. [ Roger Senhouse, member of the Bloomsbury Group. ] Autograph annotations on his (and Lytton Strachey's) Byron books, in 'Byron and Byroniana' catalogue, and on Rayner Heppenstall's BBC telepathy experiment, with copy of printed BBC 'Findings'. Catalogue: Elkin Mathews Ltd, 33 Conduit St, London W1. January 1930. BBC 'Findings', stamped with date 3 December 1945. ONE: Elkin Mathews catalogue. xii + 125pp., 8vo. 776 items, with a number of facsimiles. In grey printed wraps. Internally in fair condition, on aged paper, cocked at foot, in heavily-worn wraps with repair to rear cover. Containing numerous annotations in Senhouse's close, neat hand, mostly in pencil, giving bibliographical information relating to various entries, with reference to his own collection. Next to the entry for a first edition of 'English Bards and Scotch Reviewers' Senhouse writes: 'my copy "H S" Sold to Quaritch'. [ Pamphlet; Leslie Stephen et al ] The Book of Sunday Tramps 1879-1951. 'Compiled by CHARLES DORÉE Doctor of Science, Chief Guide 1951'. 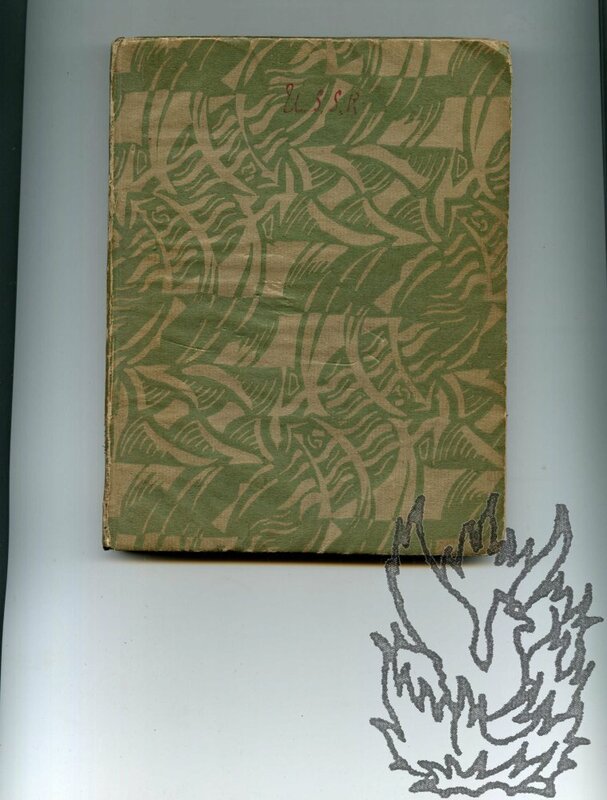 20pp., 8vo, green printed wraps, sunned at edges, mainly good condition. Bookplate of The Authors' Club. With Foreword, list of Chief Guides (Leslie Stephen, founder, Thoby Stephen, Adrian Stephen), biography of Leslie Stephen (including peaks climbed), history and anecdotes, , Properties and Customs of the Sunday Tramps, Procedures, Notable Events, "Notes from the Black Book of Stephen", "Further Extracts from the Red Book", "Members of the Sunday Tramp (1879-1894)" (includes Stephen, Julian Hawthorne, etc. ), "Members of the Sunday Tramps (1904-1951)" (includes J.M. [Lord Annan and Virginia Woolf's cousin Dorothea Jane Stephen.] Three Autograph Letters Signed from 'N. G. Annan' to 'Miss Stephen', on his biography of her uncle Sir Leslie Stephen. With autograph notes by her, including a childhood reminiscence. All three on letterhead of King's College, Cambridge. The three dated by the recipient to 'Spt. or Oct. 1951', '2/10. [2 October] 1951' and '29/2/52' [29 February 1952]. The three letters in very good condition; the first two attached to one another in one corner by a stud. Also included is Dorothea Stephen's copy of Annan's biography ('Leslie Stephen: His Thought and Character in Relation to his Time', 1951), worn and without dustwrapper, with her ownership signature ('D J. Stephen'), and a page of autograph notes critical of the book at the rear. [Margaret Francis Harris, theatre designer.] 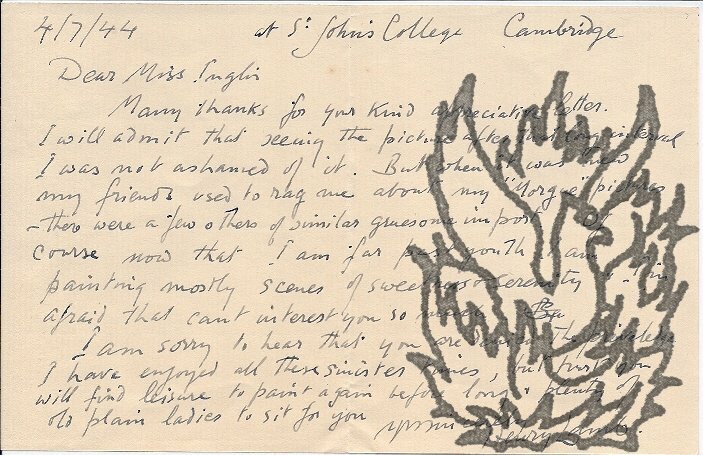 Autograph Letter Signed ('Margaret Harris') to 'Mr Rhodes', discussing the sale of her 'Motley designs' to the University of Illinois. On letterhead of the Theatre Design Course at Riverside, Riverside Studios, Crisp Road, Hammersmith. 17 June 1982. 2pp., 8vo. In very good condition, on lightly-aged paper. She apologises for not being able to be 'helpful on any of your questions'. She does not even possess a copy of her own 'Designing and Making Stage Costume'. 'I have no Motley designs at all, as every one which was in my possession has been sold to the University of Illinois, who have taken the whole collection of about 3000 swatches.' She is glad to hear that he has some of them, 'as it means that there are a few still in this country'. [Beryl de Zoete, dance critic and orientalist.] Autograph Card Signed ('Beryl de Z.) to the anthropologist Erich Alport, regarding peonies and 'flower viewing'. 50 Gordon Square, WC [London]. Postmarked date 28 May 1950. [Group Captain Peter Townsend.] Seventy black and white press photographs of Group Captain Peter Townsend and his second wife Marie-Luce Jamagne, taken around the time of the couple's marriage, many with captions. Taken around the time of the couple's marriage in 1959. The photographs come from a range of news agencies (Associated Press; UPI; Publifoto Roma; Keystone; Dalmas-Orion; APIS Paris; Agence France-Presse; AGIP; Europress; Telephoto), and range in size from 20 x 30 cm down. The collection is in fair overall condition, but some of the prints are dogeared and worn, and others are affected by damp, which has attached a couple of them to one another. A few of the prints are marked up on the reverse for publication. One dated 1948, another1950, one undated. Three cards (bifoliums), 15 x 12.5cm, 11.5 x 18cm, 10 x 12.5, inscribed by Lamb either below image on front or on inside blanks. Images, two b & w, one faintly purple background, presumably by him, are: Madonna and child (inscribed page "With love from | Henry Lamb"); Carol Singers (inside "Best wishes from | Henry Lamb") ; children and teenagers playing cards (under image on front "With love to you both | from | Henry Lam.| Xmas/48"). Image available on my website. Autograph Manuscript by Sir Albert Edward Richardson, Professor of Architecture, University College, London, titled 'Brief History of Painting and Analysis of Masterpieces', with 156 postcards laid down as illustrations. Avenue House, Ampthill, Bedfordshire; St. Catherine's College, Cambridge; University College, London. 1939 to 1940. 79pp., 8vo. In stout, thumb-indexed diary for 1930. In fair condition, on aged paper, in heavily worn binding, lacking spine and bowed by the excess material it contains. Ownership inscription by Richardson on flyleaf: 'A E Richardson ARA | Avenue House, | Ampthill Beds. | St. Catherine's College Cambridge, | 1939-1940 | University College, London.' Richardson published a number of works on architectural matters, but nothing on the history of art. 'Keith Grant Tribute' issue of 'The Daub', 'Group IV's magazine', for painting students at the Working Men's College in Camden, with review by Grant of 'diploma week' at the Royal College of Art', and 'Sketch Club Cuttings'. [Working Men's College, Camden, London.] July 1958. An interesting and scarce item. There are no copies of any issues of this magazine on either OCLC WorldCat or COPAC, and there is no record whatsoever of 'Group IV' itself. Now acknowledged as one of Britain's finest landscape painters, Keith Grant joined the Working Men's College on finishing his National Service with the RAF; he then enrolled at Willesden Art School, before joining the Royal College of Art, where he studied under Colin Hayes, John Minton and Kenneth Rowntree. 22pp., 4to. [Printed Spanish Civil War handbill.] Spanish Youth Foodship Committee. (Incorporating Youth Organisations throughout the Country. Please Help Feed the Starving in Spain [...]. Printed on one side of an 18.5 x 12.5cm. piece of paper. In fair condition, on aged and creased paper. Reads in full: 'SPANISH YOUTH | FOODSHIP COMMITTEE | (INCORPORATING YOUTH ORGANISATIONS THROUGHOUT | THE COUNTRY) | Please Help Feed the Starving in Spain | The need is | URGENT | YOU| can help with gifts of non- | perishable groceries etc. | (POTATOES, TINNED FOODS, ETC.) | TO BE COLLECTED | on Saturday, 24th, April. | BY MEMBERS OF THE EALING YOUTH GROUP | LEAGUE OF NATIONS UNION | THE CHALLERNAM PRESS, 110, GAUDEN ROAD, S.W.1.' Scarce: no copy on COPAC, and nothing by the Challernam Press. Typed Note Signed from the novelist Naomi Mitchison to 'Miss Steele', asking her to forward a letter. On letterhead of River Court, Hammersmith Mall, W6. 12 December 1932. 1p., 12mo. Good, on lightly-aged paper. She writes that she is enclosing a letter, which she would like sent on 'to the Manager of the Bournemouth Little Theatre Club if you will, as I do not know the address'. 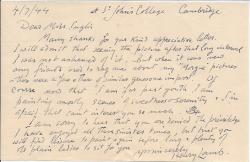 Autograph Letter Signed from English painter Henry Lamb, R.A., to fellow-artist Jean Inglis. 4 July 1944; St John's Cottage, Cambridge. Landscape 12mo. 12 lines. Text clear and complete. Good, on aged paper, in envelope addressed by Lamb to Inglis. On 'seeing the picture after that long interval' he was 'not ashamed of it', but 'when it was new my friends used to rag me about my "Morgue" pictures', there being 'a few others of similar gruesome import'. Now that he is 'far past youth' he is 'painting mostly scenes of sweetness & serenity'. He is sorry that she is 'denied the priviledge [sic] I have enjoyed all these sinister times', that of being able to paint. Autograph account by Frederick Leman Whelan of a visit by him to the Soviet Union in 1936, as leader of 'the League of Nations Union party' of British 'useful idiots'; with other matter relating to the U.S.S.R.
Small 4to, 61 pp, with the first four pages unpaginated and the last ones paginated 1-57. In notebook of good laid paper, in decorative boards. Text clear and complete. Very good, on lightly-aged paper; in worn and chipped wraps, with 'U.S.S.R.' on spine and front board. Various addresses by Whelan inside the front cover, with the date 1936 amended to 1945 and 1950. Pages of slogans and abbreviations are followed by the notebook itself. The volume intersperses notes on the visit (ending at p.31) with extracts of quotations, statistics and other matter about the Soviet Union. Anonymous drawing of him painting. English Camden Town Group Painter (1878-1914). Dimensions seven inches by ten inches. Grubby, but in good condition. From the Mark Bonham Carter collection. Captioned 'Spencer Gore | Freddy', with an arrow pointing to impressionistic representation of figure, nine inches high, of the artist in a suit, with high-collared shirt, holding a palette in his left hand and with his right hand outstretched and painting onto a canvas. Around the figure dabs of watercolour and a representation of a foot. Crude drawing of seascape on reverse. Together with scrap of paper reading 'MR.